According to this article, well known industry mag Publishers Weekly is going to "embrace the self-publishing phenomenon" and begin listing self-published titles in a quarterly supplement. They are books and that is what PW cares about. And we aim to inform the trade. On the surface, it seems they're actually acknowledging this red-headed stepchild of the publishing world. They even claim they're going to review at least 25 self-pubbed books per supplement. Perhaps those indie authors who fought so long and hard for respect will finally get some recognition from the industry that spurned them. Intrigued? Interested? Willing to give it a try? All it takes is $149 for the processing fee. For that fee, PW will print your title, author name, ISBN, and a brief description, in their supplement. The fee does not include a review. They used the phrase "inform the trade" two different times, as if to hammer home the point that their magazine is there to serve the industry. At the end of the article, they even say, "books are our business." Actually, this little venture seems more like "authors are our business." If PW truly believed in the worth and merit of self-pubbed books, and that their subscribers needed to know about this "phenomenon", then shouldn't they list these titles for free? If the trade really wants a compendium of self-pubbed ISBNs, surely this list will only make them more eager to sign up for another PW subscription, right? But instead, I can't see this as anything other than trying to separate a writer from her money. The chance of being reviewed is dangled there like a carrot on a stick, but there are no guarantees. Which seems even less appealing than Kirkus Discoveries, which began offering a paid review service for indie authors a few years ago, and endured considerable flack for it. Ugh. And this article was written by George W. Slowik Jr., the president of PW. Making indie authors pay for nothing more than a few sentences in a quarterly supplement (not even the actual magazine) is pretty pathetic. But saying that agents will see this, under the guise of making no promises that they will, is really yucky. The $149 fee also comes with a six month subscription to the digital edition of PW, which is normally $90. No word about getting a partial refund if PW folds before the six months is over. But if they're this needy for cash, and willing to go in this direction to get it, I don't have high hopes. Dorchester just announced it is cutting its mass market paperback line and focusing on ebooks. A few months ago, Medallion announced the same thing. I've heard, through sources who asked not to be named, that sell-through for paperbacks is as bad as 20%. In other words, out of ten printed, only two sell. Now what's going to happen if more publishers follow this business model? 1. Fewer paperbacks are published. Publishers either eliminate their paperback lines, or begin publishing more selectively, in smaller numbers, to cut costs and losses. 2. Bookstores have fewer books on their shelves, and sell fewer books as a result. Which means less money to the publishers. 3. Publishers downsize, since the ebook market, though growing, doesn't bring in the same money as print does. In order to maintain positive cash flow, they bill their accounts to pay up. 4. Their accounts--bookstores and distributors--can't pay up. They don't have the money to pay for the books they've sold--which they bought on credit. So they begin returning other books on the shelves to get credit for those. 5. Now there are far fewer books on the shelves, which means far fewer sales. So when publishers stop printing as many books as they are now, the delicate balance will shift. What does this mean to you, the author? The main reason we need publishers is for distribution. We can't get into Wal-Mart or Borders on own own. They can. So we accept 8% royalties in order to sell a lot of books. But if publishers are no longer printing books, there is ZERO reason to sign with them, because they no longer have that advantage. Especially when we can earn 70% royalties on our own. If you do sign with a publisher, make sure it contains a clause that states they MUST release it in print, or revert the rights back to you. Make sure there is specific wording for "out of print" that doesn't include ebook sales. But, if you do sign with a publisher, do you think you'll ever get your rights back? Let's say I'm running a publishing company. I see ebooks are the future, and I've got three new authors coming out in print. I gave these authors healthy advances, and there's no way they'll earn out these advances with print sales. Their contracts state the only way they'll get rights back is if the books go out of print. But if I'm making all of my money on ebooks, and I'm still not close to earning back the advance money I gave the author, I simply can't allow the books to go out of print. What should I do, as a publisher? If a book is selling very few print copies, but a lot of ebook copies, what are my options? Now, we all know that publishers are honest, and their accounting is always truthful. But what if, when facing bankruptcy, some unscrupulous publisher (as opposed to all the honest ones) decide to artificially keep a book in print in order to keep earning ebook royalties? Joe Blow gets a $50k book deal with Publisher X. Publisher X cuts the print run because they're having some money trouble, and ships out 30k copies. The book does so-so, and has a 30% sell-though. Of those 9000 copies sold at $6.99 each, Joe Blow earns $5040. However, the book is doing well as an ebook, and has sold 5,000 copies. And unlike the print books, which dwindle down to a few hundred per year, the ebook stays strong. 5,000 ebooks sold, at $6.99 each, equals $6,100 in royalties. Let's look at the royalty numbers for the first few years. Now the publisher has a problem. Joe Blow has earned out $41,213 of his $50,000 advance. By year 5, he'll certainly earn it out. But his book is pretty much out of print, which means the publisher has to revert the rights back to the author, on a book that is earning money. The publisher may be reluctant to do that, for obvious reasons. So what should Publisher X do? Maybe, incredibly, they sold more print books in Year 4 than they originally thought. Maybe they tell Joe Blow they owe him $1500 for print sales--which is enough to say the book is still in print, and then they still have the rights. Will Joe Blow ever get his rights back? Now let's look at what would happen if Joe Blow never sold the book at all. He self-pubs at $2.99, earning $2.04 royalty per book. Using the same sales figures as above, let's see what he makes. Looks like Joe earned $41,213 through his publisher, and $58,189 on his own. Plus he still owes the publisher $8787 on his advance. Chances are, Joe will earn out his advance in Year 5, and then make a steady $10k per year off of this title, through his publisher. If he'd kept the rights, he'd be making $20k in Year 5, and every year after that. But my numbers assume he'd sell the same number of books at his publisher's $6.99 price as he would at his own $2.99 price--which is doubtful. The $2.99 price will sell a lot more, based on my experience. So how much money is Joe Blow losing in the long run by signing with a print publisher? Will Joe ever get his rights back when "creative accounting" comes into play? Now, I know this scenario takes a lot of liberty with reality. None of us can imagine a future where publishers would knowingly fudge numbers. And we all know that print will remain the dominant force in publishing for years to come, even if publishers are printing fewer books and even dropping their print lines completely. Stacey was one of a few who took me into his house when I was on tour with the Rusty Nail 500. He's probably the only guy on the planet who has more rejections than I do, and his persistence and dedication to getting his work read is an inspiration to all. He's also one of these "pay it forward" type of writers who extends both hands in helping others and shining the spotlight on them. Stacey is currently doing a blog tour for his latest ebook, CLAWS 2. It's $2.99. You should check it out. STACEY: Thanks, Joe, for having me at your place in the midst of my CLAWS 2 Blog Tour. 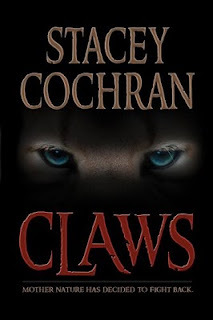 For folks unfamiliar with me, CLAWS 2, or a Blog Tour in general, you might check out my website http://www.staceycochran.com for more info. The goal of a Blog Tour is for an author to visit a number of blogs over a set period of weeks in order to promote and spread the word about his/her book. I launched CLAWS 2 on July 1 as an eBook-exclusive available through the Kindle store and have managed to set up 18 “tour stops” with blog proprietors for the months of July and August. It is one of the most cost-effective forms of marketing I’ve ever used, and so far July has been my most successful sales month in a year. What I need: 1) customers to buy my book, 2) customers to write reviews of the book, 3) other bloggers to host me during August and September. If you can host me on your blog, drop me a note as a comment or via my website. We’ll set it up. So I thought I would write today about my observations regarding sales numbers for CLAWS 2 and CLAWS. The main point that I’d like to make for newbies is that I have seen a dramatic increase in sales of CLAWS with the launch of CLAWS 2. Joe could probably speak to this subject as well, as he is the author of a great series of books. 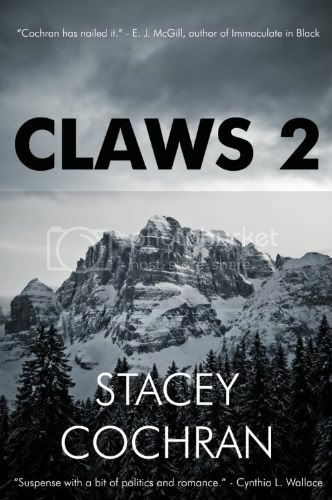 As naïve as it sounds, I had not considered that CLAWS would see any bump with the release of CLAWS 2. When I wrote these novels five years ago, my main reason for doing so was that I thought it would look cool. To my knowledge, no one has ever published a series of novels so similarly titled. Of course, filmmakers do it all the time (Nightmare on Elm Street, SAW, Friday the 13th, JAWS, Piranha, etc.). With writers, the fashion seems to be to change up the titles around a catchy theme (drinks, alphabet, colors, numbers, etc. ), but no one just calls their series TITLE 1, TITLE 2, TITLE 3, etc. I thought it would look cool, and I’d never seen it done in the publishing world. That was the height of my expectations and rationale. So far in July, the original novel (released in summer 2009) has actually outpaced the new book at a roughly 5:4 ratio. When these novels spiked in July, CLAWS actually peaked in the 100s overall in the Kindle store whereas CLAWS 2 reached only #213. It’s worth noting that the price-point for the books is different. CLAWS has been at 99 cents all along, and CLAWS 2 is at $2.99. Some folks are likely hearing of me for the first time and so are willing to give the 99-cents book a shot before purchasing the new title. 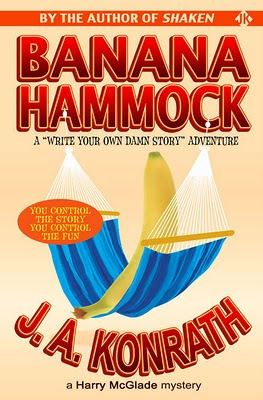 Whatever the case, the books have worked in tandem to drive up overall sales in a way that I simply did not anticipate. I’ve had a number of folks ask me if there is a CLAWS 3 in the works. The truth is I outlined some preliminary notes back in 2006 for a third book regarding spotted leopards in the American Southwest and the border fence issue. What I’d like more than anything else is to sell the series to a major publisher. I could easily write a CLAWS 3, 4, and 5, and it’s likely that such a filmable series would get optioned and could see move adaptation. I may have to find traditional success with another novel altogether before I’m able to sell the CLAWS series. Or I may not be able to sell it at all. That definitely seems to be where we’re at with it now. The sales numbers for my eBooks have been nothing short of a career break-through since May 2009 when I launched CLAWS. If there’s a lesson to be taken from this, it is that readers will buy closely-linked series books in tandem. For newbies considering how to develop a career, it might be worth thinking through how you might publish a series of books and exactly what kind of series seem to do well with publishers. Thanks so much for your time and for reading, and thank you, Joe, for hosting me today at your blog. Stacey Cochran was born in the Carolinas, where his family traces its roots to the mid 1800s. 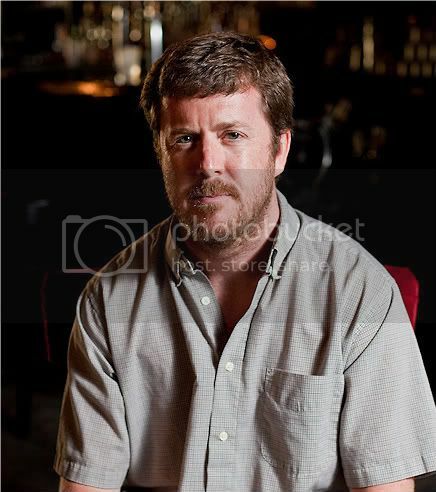 In 1998 he was selected as a finalist in the Dell Magazines undergraduate fiction competition, and he made his first professional short story sale to CutBank in 2001. In 2004, he was selected as a finalist in the St. Martin's Press/PWA Best First Private Eye Novel Contest. He lives in Raleigh, North Carolina with his wife Dr. Susan K. Miller-Cochran and their son Sam, and he teaches writing at North Carolina State University. His books include CLAWS, CLAWS 2, Amber Page, The Colorado Sequence, and The Kiribati Test.